The "Los Angeles Chargers" made in the news in a splashy way on Tuesday. Wait a second – it’s already a done deal? But the still-San Diego Chargers believe it's worth protecting the LA Chargers name as a registered trademark. It's a mystery why the Chargers didn't file a trademark application before last Thursday. The move just came to light Tuesday. Is it a market signal that they're as good as gone -- a formal announcement to follow next week? Or just a precaution? "Well, it seems like every little nugget, little kernel, little bread crumb of news is being made out be this giant thing,” says Liam Dillon, assistant editor of NBC 7’s media partner Voice of San Diego. “We've been living through whether the Chargers are going to LA for 15 years, roughly. They're certainly closer now than they've ever been." Closer to "pay dirt," figuratively speaking. This all stems from a potential NFL marriage -- not exactly made in heaven-- with Rams owner Stan Kroenke, to occupy a $1.9 billion stadium in the unfashionable LA suburb of Inglewood. But Kroenke aims to make it a fashionable "destination" with what's called "ancillary development" around the stadium that'll pack in customers besides game-day football fans. Will he give Chargers President Dean Spanos more than just second-fiddle treatment? The two sides are still talking to each other, with both maintaining media silence for now. As for that LA Chargers trademark business? "It sounds to me like they have good lawyers covering their bases in case it comes to pass,” says downtown attorney Donald Rez. 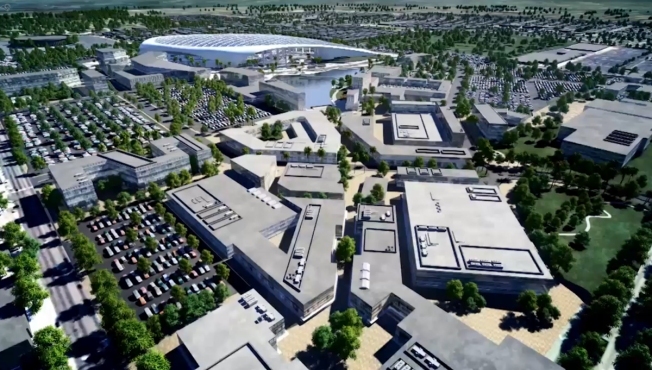 Could it also, however remotely, signal that the team is leaning hard toward Inglewood? "No,” Rez insisted. “I think it just means they have good lawyers." Still, couldn't they have thought of it earlier? Either way, the trademark application won't be reviewed by a federal agency examiner until April 14-- two weeks' after the deadline for the Bolts to tell the NFL they're moving.